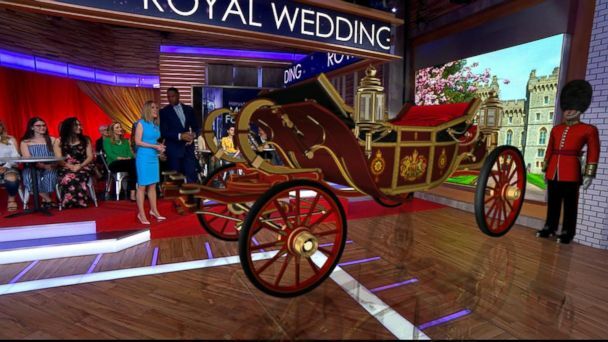 To celebrate the joyous occasion of Prince Harry and Meghan Markle's royal wedding on May 19, ABC News is bringing iconic symbols of Windsor Castle closer to your home with The Royal Wedding AR Experience - no invitation required. Available only on the ABC News iOS App, you can take a photo with your very own 3D royal carriage or pose with a 3D queen's guard. Step 1:Download the ABC News app in the Apple App Store - if you already have the app make sure you update to version 5.27 over Wi-Fi. If you are already in the ABC News app, skip directly to step 2. Step 2:On the homepage of the app - tap the Royal Wedding Augmented Reality button to begin. Step 3:Point your phone camera at a flat horizontal surface - the royal carriage will appear! You can toggle between the carriage or a queen's guard. Step 4:Snap a photo - either download directly to your phone or share it on social with #RoyalWeddingAR hashtag. You may see your very own royal photo on Good Morning America! Note: The Royal Wedding AR Experience only works on iPhone 6s and above, and only on 2017 iPads and later. Watch the royal wedding live, Saturday, May 19, starting at 5 a.m. ET on ABC.